A properly formulated diet is an essential underpinning for all in vivo research. 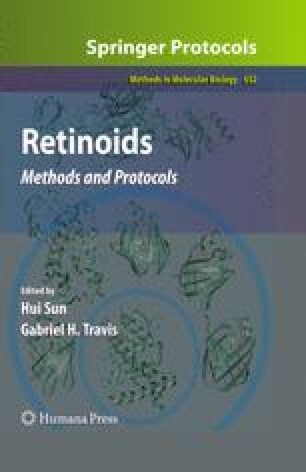 This chapter focuses on the use of diet in retinoid research from two perspectives: human research, in which diet is usually variable and analysis of dietary intake is paramount to interpreting the study’s results, and animal (rodent) research, in which diet is imposed as a factor in the experimental design, and the diet consumed is usually monotonous. Many standard rodent diets are nonpurified and the amount of vitamin A in the diet is unknown. Moreover, it is likely to be much higher than expected from the label. By using a well-formulated purified diet with an exact amount of vitamin A, retinoid status in rodents can be closely controlled to create specific physiological conditions that represent the wide range of vitamin A status present in human populations. Support: NIH grants CA-90214; DK-41479. National Cancer Institute. (2009) Short Dietary Assessment Methods. http://riskfactor.cancer.gov/diet/ and http://riskfactor.cancer.gov/diet/screeners/ (last accessed April 22, 2010). Feed Inspector's Manual. (2000) Chapter 4, Label Review, 2nd ed., Association of American Feed Control Officials Inspection and Sampling Committee. http://www.aafco.org/Portals/0/Public/COMPLETE_INSPECTORS_MANUAL.pdf (last accessed April 22, 2010). Donnelly, T.M., Brown, C.J. (2009) Rodent Husbandry and Care. http://www.veterinarypartner.com/Content.plx?P=A&A=2497&S=4 (last accessed April 22, 2010). National Organization of Bionutritionists. Well-Controlled Diet Studies in Humans: A Practical Guide to Design and Management. http://www.nabconnection.org/ (last accessed April 22, 2010).